The innovation landscape I have sketched previously suggests that there could be some kind of symmetry. 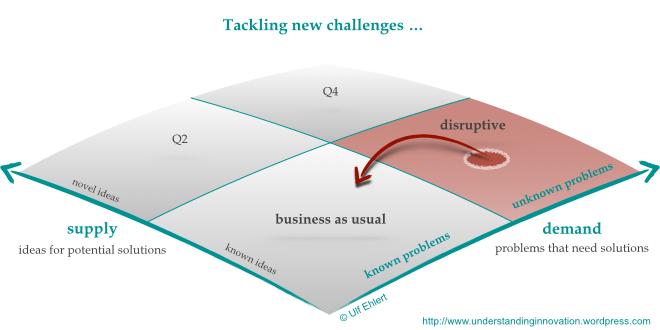 The third quadrant (disruptive) should have some similarity with the second quadrant (research), shouldn’t it? Well, it is true that both quadrants have one common characteristic: for both of them, one dimension is known, while the other one is unknown. If you consider the rules and tools in the innovation landscape, then research is looking for new tools, but stays within the known rules, whereas disruption works with known tools in an area of yet undefined rules. While this presents a conceptual similarity, it does not support the transfer of the findings from the research quadrant to the disruptive quadrant. Rather, we’ll need to take a fresh look: how does disruption push the boundary? 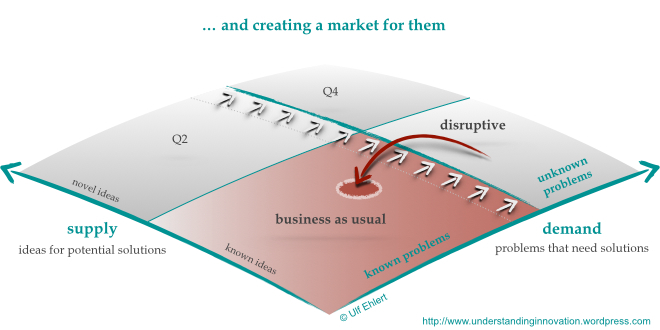 The third quadrant in the innovation landscape is framed by known ideas and novel problems. The known ideas readily provide the tools and building blocks for innovation in this quadrant; nothing new about that. The novelty in the third quadrant is in the problems that are being addressed. These are the unexpected, unacknowledged, or even ignored challenges; these are the problems people have without consciously knowing or expressing it. Notwithstanding the difficulties to replicate Jobs’s approach to innovation, he delivers the prime example for disruption and what it takes to be successful in the third quadrant. If the problem is not articulated by a customer, if there is no formal demand, the innovator is left to his own devices, and especially to his sense of anticipation, to define the challenge he’s willing to tackle. The innovator is furthermore faced with some uncertainty regarding the rules to apply, because there are no dedicated rules available. For example, the situation is not covered by existing business models, or even explicitly excluded as not being viable. This requires an interpretation of other established rules that might be transferred to and applied in a new context. Again think about Steve Jobs, this time the business model for the online music market he launched through the iTunes store. Competitors had thought about such a business model before, and dismissed it. Jobs saw an opportunity by combining many known and established elements to implement a viable business model that ultimately disrupted the entire music industry. He epitomised the entrepreneurial mindset, the independent thinking that is willing to embrace the uncertainty and to dare the interpretation. It is this mindset that anticipates a challenge, translates it to an opportunity, and takes the bull by the horns; this is the basis for success in the disruptive quadrant. In the third quadrant, the ideas and the knowledge, the tools and the building blocks for innovation already exist; but the rules, the institutions, or the business models have not yet been identified or established. It shouldn’t come as a surprise that organisations are not tailored to this type of innovation either. Organisations are costly to establish, they unfold their efficiency magic –thus the return on the upfront investment– only over time. Therefore, a considerable level of predictability and certainty is required to start setting up an organisation. And these conditions are not met in the disruptive quadrant. Prototyping novel interpretations and elastic applications of rules is not in the DNA of efficiency-driven organisations. For them, the third quadrant is too far away from their comfort zone of business as usual, it is too one-off, too uncertain. That’s why the third quadrant is the domain of the entrepreneurs who travel light, without the baggage of established organisations. Disruptive innovation enlarges the area of certainty, the space of known and established rules and institutions. It makes a larger part of the problem space accessible to organisations and their efficiency in dealing with business as usual. In summary, even though this might seem paradoxical, disruption actually paves the way for more business as usual. That is the disruptive way of pushing the boundary in the innovation landscape. P.S. This is the second in a series of posts on pushing the boundaries in the innovation landscape. The previous post addressed the second quadrant (research); the following post will deal with business as usual in the first quadrant. The series will close on the wicked fourth quadrant.